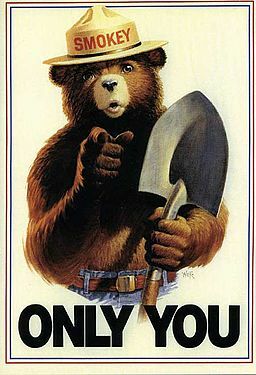 Smokey the Bear is the icon for preventing forest fires. (See him in action in this 1944 PSA and in an ad today.) But he could also serve as the poster child for social marketing. Noting that each of us sees or hears around 3,000 ads a day, Pipher asks us rather to imagine those messages encouraging us to: eat more fruits and vegetables, brush our teeth, call our great aunt, and behave kindly toward one another. What she’s talking about is called Social Marketing. Besides marketing to raise funds for their mission, many nonprofits do social marketing to persuade people to do something to help society (and themselves). We’ve all been impacted by social marketing campaigns that have urged us to buckle up for safety, say no to drugs, recycle, use condoms, not let friends drive drunk, eat more fruits and vegetables, keep America beautiful. Those that succeed create significant measurable progress in society. One campaign they discuss in the book is the Save the Crabs, Then Eat ‘Em effort to clean up Chesapeake Bay. Here’s a blog post by Alexandra Rampy with a helpful overview of the subject with great links. Here’s an interview with Philip Kotler that gives an overview of Social Marketing. The Ad Council has been “inspiring change, improving lives” for 70 years. Their site is packed with resources as is their blog AdLibbing. Beautiful Trouble is more activist, not quite by the book in its approaches—maybe it’s social marketing 2.0?